Max Effort Day 3 results above. Awesome job to everyone who PR’d. We have been very lucky lately. Luck meaning, preparation meeting opportunity. You work hard, show up consistently and are laser focused on achieving your goals. Glad to see the fruits of your labor pay off! 1) Scott Freedland with a 255# squat clean PR. Michelle Panceroff and Yvette both PR’d and both tied with 125#s. Good workkkk! 2) Vinny Pizzo with 96 ABMAT sit-ups in 2 minutes (2nd straight week leading in a max effort – last week strength and this week core strength endurance. Way to show well roundedness) Yeahhhh buddy! Paula Halstead with a large lead for the women with 85 ABMAT sit-ups in 2 minutes. Awesome core strength, Paula! 3) Garrett Merryman with a swift 14.21 second 60 yard shuttle sprint. Errol Talley had the lead until Garrett stole the cake for the last sprint of the night. Good work, Garrett! 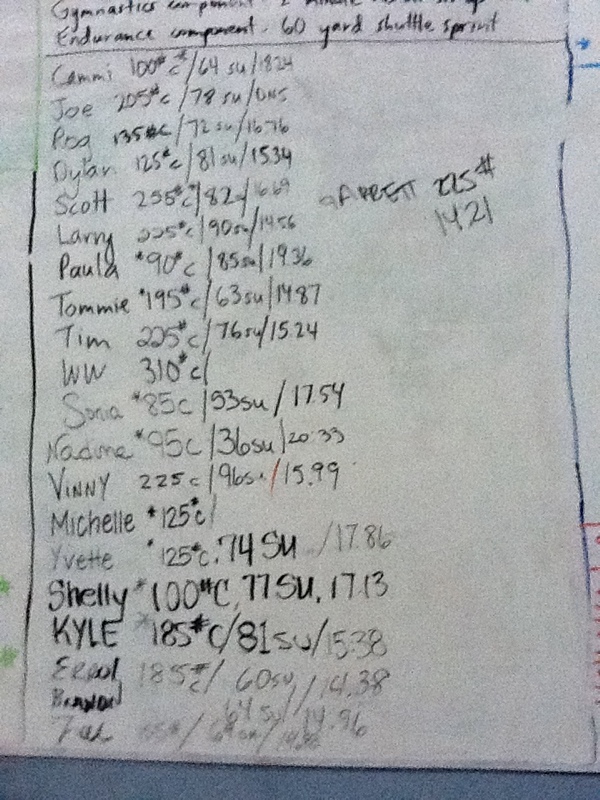 Shelly Vander Velde edges out Sonia Johnson with a 17.21 second 60 yard shuttle sprint. She did that on her final attempt, too. Way to go, Shelly! WOD – With a continuously running clock, do one pull-up and one handstand push-up the first minute, two pull-ups and two handstand push-ups the second minute, three pull-ups and three handstand push-ups the third minute… continuing as long as you are able. When you cannot complete the required number of reps for either exercise, continue only with the other as long as you are able. Post number of minutes successfully completed for each exercise to comments and www.beyondthewhiteboard.com. Their sum is your score. Thanks for the pep talk on mental strength…I think we all needed a reminder of what we are capable of doing, I know I did!